Robert's birthday at Australia Zoo is going to be HUGE! Come along on 1st December 2010and help Robert celebrate turning SEVEN at Australia Zoo! Crikey! 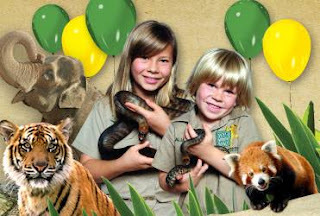 Come along to Australia Zoo, on 1st December 2010, when the gates open early at 8am, with all kids receiving FREE entry*! Grab your piece of Robert's birthday cake, and Join Jurassic Joe as he entertains the crowd with his delightful Dino songs. Enter the Major Prize Draw for your chance to win some fossil-riffic prizes! Sailport Apartments Mooloolaba © 2015. Travel theme. Powered by Blogger.